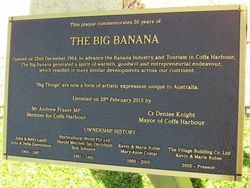 A plaque commemorates the 50th anniversary of The Big Banana which was opened in 1964 to advance the banana and tourism industries. In 1964 John Landi wanted something to make passing traffic stop at his road side banana stall. He had heard of a "Big Pineapple" in Hawaii and thought that something big would definitely stop traffic. With assistance of 1200 pounds and local engineer, Alan Chapman, who set about designing the giant banana by cutting the best looking banana he could find into 40 pieces and developing plans from which builders could work from, the Big Banana could become a reality. Not long after, John Enevoldson joined as a partner and they expanded with 20 more plantation acres, a shop, cafe and a larger car park. In 1968 John Landi retired and sold his share to John Enevoldson who continued building the business until 1988 when it was sold to Horticulture World, which was part owned by local businessman Bob Johnston. Bob continued expanding the Big Banana into an educational showcase before undergoing a $30 million redevelopment that re- opened in June 1989. 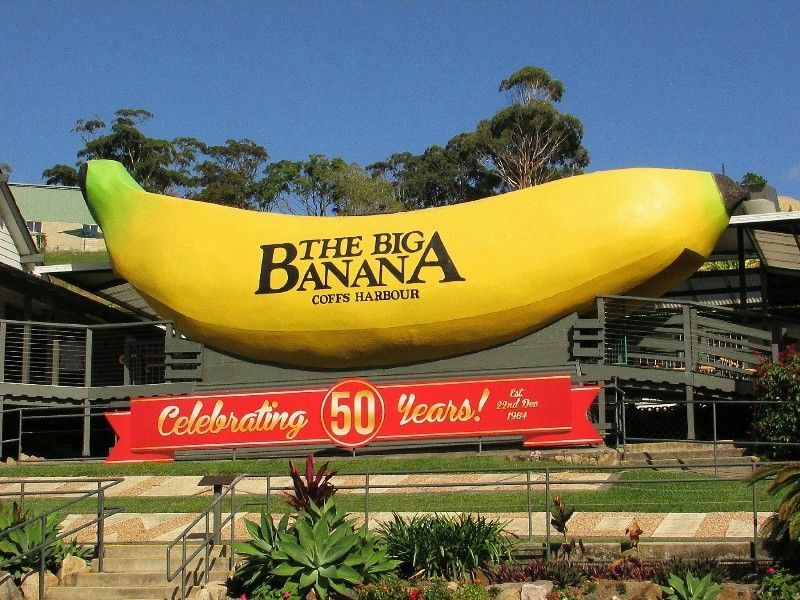 Opened on 22nd December 1964, to advance the Banana Industry and Tourism in Coffs Harbour, The Big Banana generated a spirit of warmth, goodwill and entrepreneurial endeavour, which resulted in many similar developments across our continent. "Big Things" are now a form of artisitic expression unique to Australia.